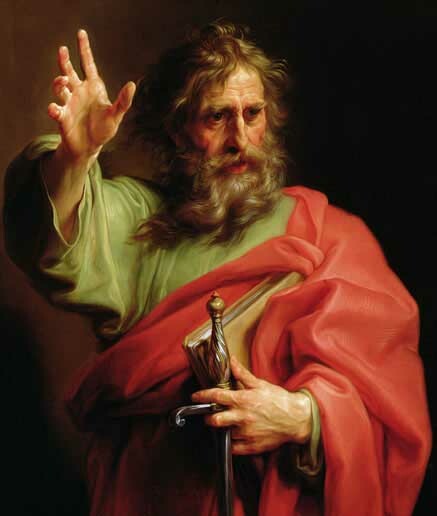 Who Was the Apostle Paul? This coming Sunday the saints known as Lake Wylie Baptist Church will begin marching through Paul’s epistle to the churches of Galatia. To help you prepare to read, understand, and apply the message of this book I decided to give you a short introduction to its author. Who was the apostle Paul? Born in Tarsus of Cilicia (Acts 9:11) likely in the first decade of the first century. He was a member of the Israelite tribe of Benjamin (Philippians 3:5). His brith name was Saul after the first king over Israel. Paul was his Roman name. Although he was Jewish by birth Paul was also a Roman citizen; a benefit likely purchased by his parents at the cost of more than a year’s wages. Acts 22:3 tells us that Paul learned Judaism at “the feet of Gamaliel” who was the most influential Rabbi of his day. As a young man Paul viciously persecuted Christians, having them imprisoned and even put to death. While on his way to persecute Christians in the town of Damascus Paul converted to Christianity through a vision of the risen Lord and the ministry of a man named Ananias (Acts 9). After spending a few years ministering to various groups, Paul and Barnabas we commission by the church of Antioch as missionaries. Paul would spend the rest of his life planting churches in Asia Minor and Macedonia (modern day Turkey and Greece, respectively). As Paul planted churches all over the world he wrote letters of continuing instruction to those churches. The New Testament includes 13 of Paul’s letters to various churches and disciples making up nearly 1/3 of the New Testament. Luke, author of a gospel and the book of Acts, dedicates 16 chapters of Acts to Paul’s ministry (13-28). After causing an uproar in the city of Jerusalem Roman authorities imprison Paul and he appeals to Caesar (Acts 21). Church tradition tells us that Emperor Nero heard Paul’s case and released him. Later in the mid-60s Paul would be arrested an beheaded sometime before A.D. 68. So much more could be said about this astounding man. If you live in the Charlotte area I hope you’ll consider joining us this Sunday as we kick-off our sermon series in Galatians. If you have any comments or questions I’d love to chat with you in the comments.